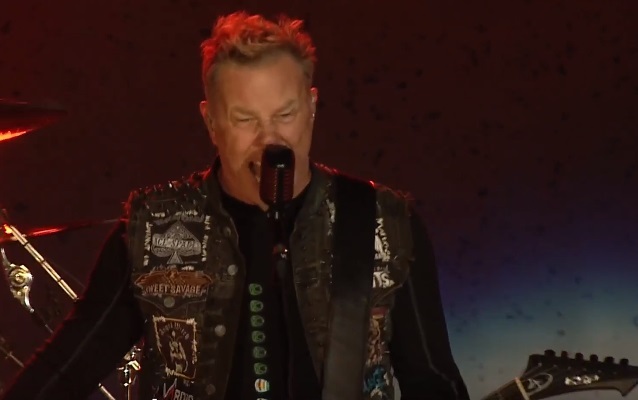 METALLICA's entire performance at Band Together Bay Area can be seen below. The benefit concert, which took place yesterday (Thursday, November 9) at AT&T Park in San Francisco, supported recovery efforts for the recent firestorm that swept through Northern California. Also scheduled to appear were G-Eazy and DAVE MATTHEWS BAND. METALLICA guitarist Kirk Hammett, who nearly lost his house in Sonoma's Mission Highlands, told the San Francisco Chronicle: "On the Cal Fire map, the fire ends right on top of my house. The reality is that it ended at my front gate. It's brutal. The mental and psychological toll is what I always think about." The METALLICA members said in a statement that they were "proud" to take part in the event "to assist the families impacted by the fires and show our immense appreciation to the thousands of first responders who have been working tirelessly since the fires began." They explained: "[In October] Northern California, the community that we have called home for over thirty-four years, endured devastating wildfires. We're extremely saddened by the suffering that so many are feeling in the Bay Area, but are also inspired by the enormous outpouring of love and support from all around the country." One hundred percent of the ticket price will be donated to Tipping Point Community benefitting low-income, vulnerable communities impacted by the crisis, including vineyard workers, immigrants, displaced young people, and students.